Candace H. Johnson Austin 7, of Lindenhurst and his brother, Ian, 9, (last name withheld) talk with Ralph Klein, of Johnsburg about his homemade Newtonian reflector telescope after the telescope was adjusted to see the moons of Jupiter during the Moon Over Lake Villa event at the Lake Villa District Library. 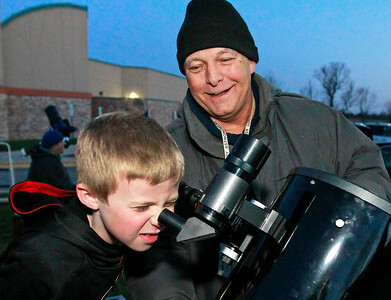 Candace H. Johnson Porter Cramond, 7, of Lake Villa looks at the moon as Mike Dziedzic, of Round Lake teaches him about what he is seeing in his 10-inch Dobsonian telescope during the Moon Over Lake Villa event at the Lake Villa District Library. 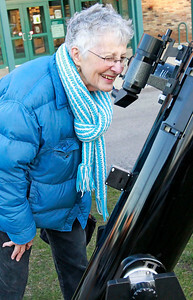 Candace H. Johnson Ruth Barnard, of Lake Villa looks into an 8-inch Dobsonian telescope to see the moon during the Moon Over Lake Villa event at the Lake Villa District Library. 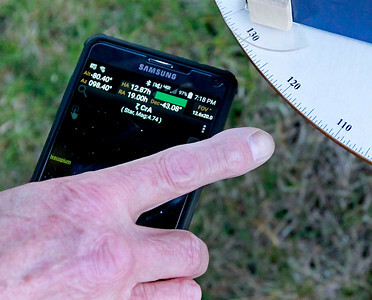 Candace H. Johnson Ralph Klein, of Johnsburg uses information on his phone to adjust an azimuth ring on the base of his homemade Newtonian reflector telescope to point to the moons of Jupiter during the Moon Over Lake Villa event at the Lake Villa District Library. 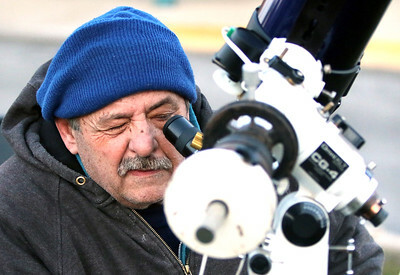 Candace H. Johnson Gary Poliquin, of Lake Zurich looks at the moon through his Maksutov telescope during the Moon Over Lake Villa event at the Lake Villa District Library. 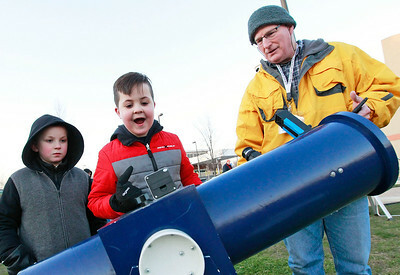 Austin 7, of Lindenhurst and his brother, Ian, 9, (last name withheld) talk with Ralph Klein, of Johnsburg about his homemade Newtonian reflector telescope after the telescope was adjusted to see the moons of Jupiter during the Moon Over Lake Villa event at the Lake Villa District Library.